Fibromyalgia History: Historically, fibromyalgia – or conditions very like it – have been reported for hundreds of years, under many names, including the most unsatisfactory term ‘fibrositis’. 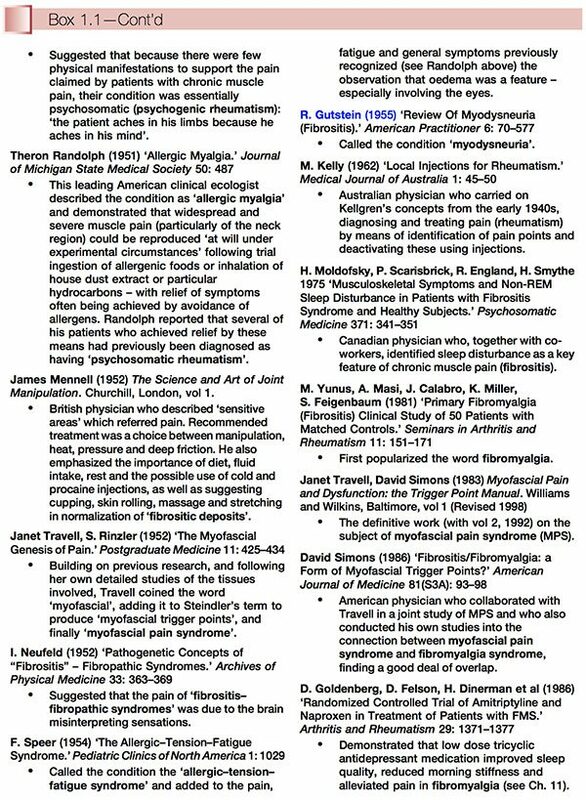 The fascinating history of what we now call fibromyalgia syndrome (FMS) and myofascial pain syndrome (MPS) has been catalogued by several modern clinicians working in the sphere of chronic muscle pain, from whose work the material summarized in Box 1.1 has been compiled. 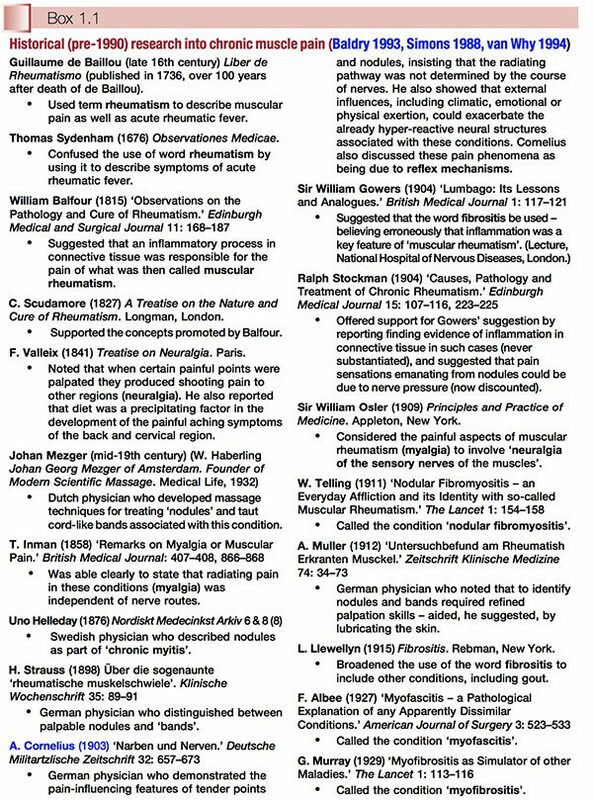 Thanks are due to these individuals (Peter Baldry, David Simons and Richard van Why in particular) for revealing so much about past studies into the phenomenon of chronic muscle pain. What we can learn from this information is just how long ago (well over 150 years) particular features were recognized, for example pain referral patterns and characteristics such as taut bands and ‘nodules’, as well as insights from many astute researchers and clinicians into the pathophysiology of these conditions. In the wake of successful classification criteria, a surge of investigative energy in the early 1990s led to a number of important new observations. FMS was found to be universally common. It was present in approximately 2% of the adult population of the USA and exhibited a similar distribution in most other countries where valid epidemiological studies had been conducted. Adult women were affected five to seven times more commonly than were men. In children the gender distribution was about equal for boys or girls. When psychosocial and physical/functional factors of people with FMS were compared with those six different, predominantly chronic pain syndromes (upper extremity pain, cervical pain, thoracic pain, lumbar pain, lower extremity pain and headache), it was found that the fibromyalgia group experienced the most difficulties, by a significant margin. In regard to gender distribution of these seven chronic pain conditions, it was noted that fibromyalgia (and headache) are experienced by more females than males (Porter-Mofitt et al 2006). • It is a non-deforming rheumatic condition, and, indeed, one of the commonest such conditions. • It is an ancient condition, newly defined (controversially – see below) as a disease complex or syndrome. • There is no single cause, or cure, for its widespread and persistent symptoms (however, as will become clear, there do seem to exist distinct subsets of individuals with different aetiologies to their conditions, such as thyroid imbalance and whiplash injuries). • Its complex causation often seems to require more than one essential aetiological factor to be operating, and there are numerous theories as to what these might be (see Ch. 4). • There has been an explosion of research into the subject over the past decade (one data search on the internet revealed over 20 000 papers which mention fibromyalgia as a key word). Despite its earlier medical meaning, which suggested involvement of both articular and non-articular structures, the word rheumatic has, through common usage, come to mean ‘a painful but nondeforming soft tissue musculoskeletal condition’, as distinct from the word arthritic which suggests articular and/or deforming features (Block 1993). For the purposes of practicality this book accepts that the current widely used ACR definition is a hypothesis that is evolving, but that it may be flawed (see below). The definition as presented in Box 1.2 allows for the categorization of individuals with chronic pain and associated symptoms into subgroups, and offers clinicians a chance to begin to decipher the confusing patterns of symptoms displayed and reported by people who have been so labelled. However, not all experts, including many of the contributors to this text, accept the ACR definition. Nevertheless, since it forms the foundation for much of the research reported on in the book, the current definition needs to be given due consideration. What Are The Arguments Against The ACR Definition? Recent data tend to support the notion that FMS is a disorder of the central nervous system pain processing pathways, and not some type of primary auto-immune disorder of the peripheral tissues. 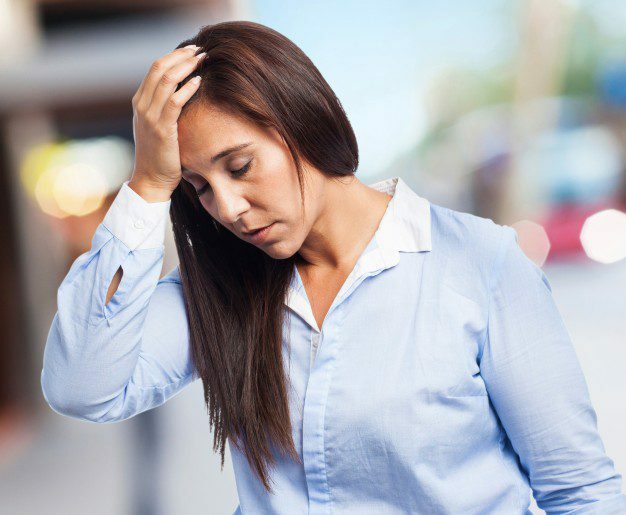 It is quite possible that the term FMS is a poor choice of words, for it implies that patients with a variable symptom complex all have the same singular disease or disorder. As will be clear in subsequent chapters, this is precisely the message that this book will promote – that there are numerous aetiological influences relating to the symptom cluster represented by people with a diagnosis of FMS, and that within that population subgroups can be identified that demand quite distinctive therapeutic handling, compared with other subgroup cohorts. A logical extension of this multicausal scenario is a model that offers a variety of potential therapeutic interventions, none of which would have universal applicability, and most of which would be most usefully employed in treatment of specific subgroups within the overall diagnosis of FMS. The chapters in this book that reflect a variety of therapeutic approaches include those that evaluate and explain the use of acupuncture, endocrine issues, psychological influences, myofascial trigger points/ dry needling, use of microcurrent, hydrotherapy, therapeutic touch, manipulation, massage, exercise, nutrition and various other clinical methods. The issues surrounding FMS subsets, and of possible over(or mis-)diagnosis of FMS, are explored more fully in Chapters 3, 4 and 5. • If pressure varies only slightly, so that on a ‘good day’ a patient may report sensitivity and tenderness rather than ‘pain’ when tender points are being tested, the patient may therefore not ‘qualify’; this could have very real insurance benefit implications, as well as leaving distressed individuals still seeking a diagnosis which might help them understand their suffering. • If all other criteria are present, and fewer than 11 of the 18 possible sites are reported as ‘painful’ (say only 9 or 10), what diagnosis is appropriate? • If there are 11 painful sites but the ‘widespread’ nature of the pain is missing (as per the definition in Box 1.2), what diagnosis is appropriate? Clearly, what is being observed in people with widespread pain and who also demonstrate at least 11 of the 18 test points as being painful is a situation which represents the distant end of a spectrum of dysfunction. Others who do not quite meet the required (for a diagnosis of FMS) number of tender points may well be progressing towards that unhappy state. As reported earlier, approximately 2% of the population meet all the ACR criteria (Wolfe et al 1993). 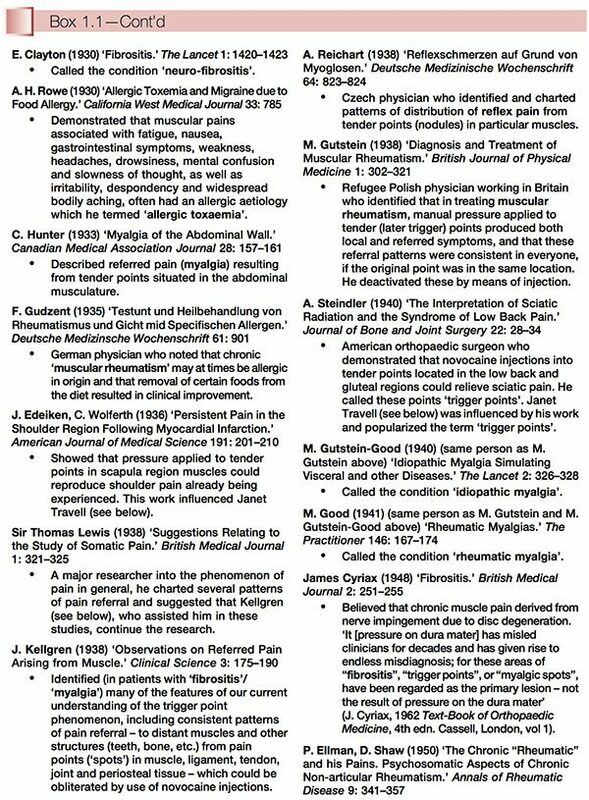 A great many more people, however, are advancing in that direction, according to both British and American research, which shows that about 20% of the population suffer ‘widespread’ pain that matches the ACR definition, with almost the same number, but not necessarily the same people, demonstrating 11 of the specified 18 tender points as being painful on appropriate testing, also in accordance with the ACR definition. 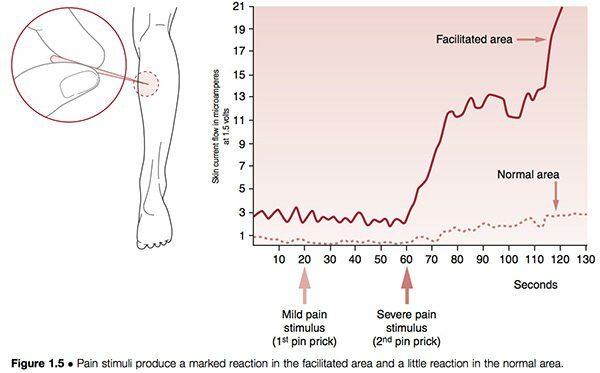 Some people have the widespread pain and not enough painful points, while others have the points but their generalized pain distribution is not sufficiently widespread. What Condition Do They Have If It Is Not FMS (Croft et al 1992)? If all the criteria are not fully met, and people with, say, 9 or 10 points (rather than the 11 needed) are offered a diagnosis of FMS (and therefore become eligible for insurance reimbursement or disability benefits, or suitable for inclusion in research projects), what of the person with only 8 painful points who meets all the other criteria? In human terms this is all far from an academic exercise, for pain of this degree is distressing and possibly disabling, whether or not 11 (or more) points are painful. Clinically, such patients should receive the same attention, wherever they happen to be in the spectrum of disability, and whatever the tender point score, if their pain is sufficient to require professional attention. The cause of FMS is unknown, but growing evidence indicates that its pathogenesis involves aberrant neurochemical processing of sensory signals in the CNS. 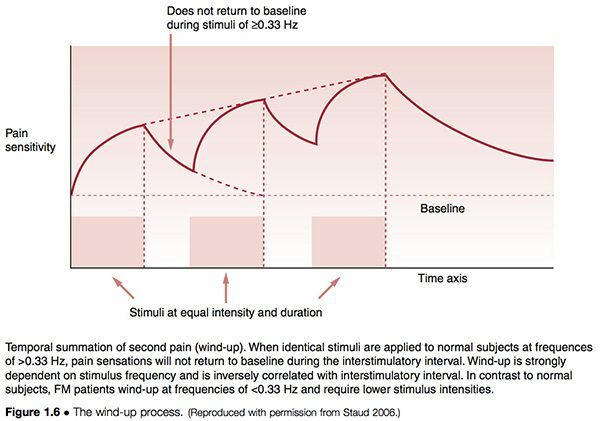 The symptomatic result is lowering of the pain thresholds and an amplification of normal sensory signals until the patient experiences near constant pain. As will also become clear, the components of the pathogenesis of the condition commonly include biochemical, psychological and biomechanical features. Somewhere in the combination of causal elements and unique characteristics of the individual may lie opportunities for functional improvement and the easing of the often intractable pain and other symptoms associated with FMS. In 1992, at the Second World Congress on Myofascial Pain and Fibromyalgia in Copenhagen, a consensus document on fibromyalgia was produced and later published in The Lancet (Copenhagen Declaration 1992). This declaration accepted the ACR fibromyalgia definition as the basis for a diagnosis, and added a number of symptoms to that definition (apart from widespread pain and multiple tender points), including persistent fatigue, generalized morning stiffness and non-refreshing sleep. 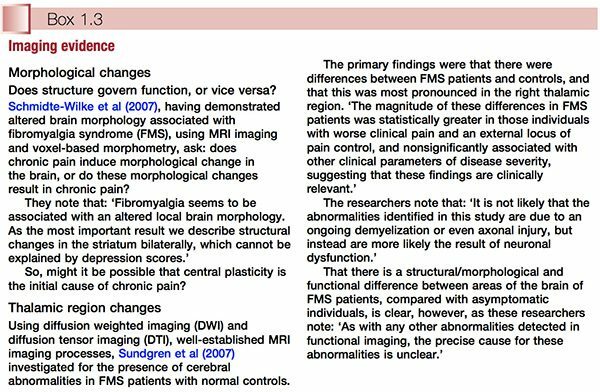 The Copenhagen document recognized that people with FMS may indeed at times present with fewer than 11 painful points – which is clearly important if most of the other criteria for the diagnosis are met. In such a case, a diagnosis of ‘possible FMS’ is thought appropriate, with a follow-up examination suggested to reassess the condition. There are practical implications for a cut-off point (of symptoms or tender point numbers, for example) in making such a diagnosis: these relate directly to insurance reimbursement and/or disability benefits, as well as, possibly, to differential diagnosis. The Copenhagen document adds that FMS is seen to be a part of a larger complex which includes symptoms such as headache, irritable bladder, dysmenorrhoea, extreme sensitivity to cold, restless legs, odd patterns of numbness and tingling, intolerance to exercise, and other symptoms. The Copenhagen Declaration (1992) of the symptoms associated with FMS (over and above pain, which is clearly the defining feature) also addresses the psychological patterns often related to FMS, namely anxiety and/or depression. The possible psychological component in FMS is an area of study fraught with entrenched beliefs and defensive responses. A large body of medical opinion assigns the entire FMS phenomenon – as well as chronic fatigue syndrome (CFS) – to the arena of psychosomatic/psychosocial illness. An equally well-defined position, occupied by many health care professionals as well as most patients, holds that anxiety and depression symptoms are more commonly a result, rather than a cause, of the pain and disability being experienced in FMS (McIntyre 1993a). A 1994 review paper analysed all British medical publications on the topic of CFS from 1980 onwards and found that 49% favoured a non-organic cause while only 31% favoured an organic cause. When the popular press was examined in the same way, between 70% (newspapers) and 80% (women’s magazines) favoured an organic explanation (McClean & Wesseley 1994). Typical of the perspective which holds to a largely ‘psychological’ aetiology is a multicentre study by Epstein and colleagues, which was published in 1999. It concluded: ‘In this multicenter study, the persons with FMS exhibited marked functional impairment, high levels of some lifetime and current psychiatric disorders, and significant current psychological distress.’ The most common disorders noted were major depression, dysthymia, panic disorder and simple phobia. Many of the illnesses [CFS, FMS] treated using this model [neurosomatic] are still termed ‘psychosomatic’ by the medical community and are treated psychodynamically by psychiatrists, neurologists and general physicians. Social anthropologists also have their theories describing CFS as the ‘neurasthenia’ of the 1990s, and a ‘culture bound syndrome’ that displaces the repressed conflicts of patients unable to express their emotions (‘alexithymics’) into a culturally acceptable viral illness or immune dysfunction. Cognitive–behavioural therapy is perhaps more appropriate, since coping with the vicissitudes of their illnesses, which wax and wane unpredictably, is a major problem for most of those afflicted. Few investigators in psychosomatic illness (except those researching panic disorders) have concerned themselves about the pathophysiology of the patients they study, seeming content to define this population in psychosocial phenomenological terms. This position becomes increasingly untenable as the mind–body duality disappears. Goldstein says that he only refers patients for psychotherapy if they are suicidally depressed. He emphasizes the normalization (using a variety of medications) of the biochemical basis for neural network dysfunction, which he has satisfied himself is the underlying cause of these (and many other) conditions. Goldstein’s methods will be examined in later chapters; however, it might prove useful at this stage to make a slight diversion in order to clarify the importance of looking beyond apparent causes to attempt to uncover their origins. As we progress through the saga which is FMS (and CFS) we will come across a number of welldefined positions which maintain that the dominant cause is X or Y – or more usually a combination of X and Y (and possibly others). The truth is that in some important instances these ‘causes’ themselves have underlying causes, which might usefully be therapeutically addressed. An example – which will emerge in more detail later – is the suggestion that many of the problems associated with FMS (and CFS) are allergy related (Tuncer 1997). This may well be so in the sense that particular foods or substances can be shown, in given cases, to provoke or exacerbate symptoms of pain and fatigue. But what produces this increased reactivity/sensitivity? Are there identifiable causes of the (usually food) intolerances (Ventura et al 2006)? In some cases this can be shown to result from malabsorption of large molecules through the intestinal wall, possibly due to damage to the mucosal surfaces of the gut (Tagesson 1983, Zar 2005). In some cases the mucosal damage itself can be shown to have resulted from abnormal yeast or bacterial overgrowth, resulting from prior (possibly inappropriate) use of antibiotics and consequent disturbance of the normal flora, and their control over opportunistic organisms (Crissinger 1990). Or the disturbed gut mucosa may be associated with endotoxaemia involving disturbed beneficial bacteria status (McNaught et al 2005). The layers of the onion can be peeled away one by one, revealing causes which lie ever further from the obvious. The pain is aggravated by allergy, which results from bowel mucosa damage, which results from yeast overgrowth, which results from excessive or inappropriate use of antibiotics… and so on. The allergy in this example is not a cause per se but an exacerbating factor, a link in a chain, and while treating it might satisfactorily reduce symptoms, it would not necessarily deal with causes. Neither would treating the bacterial or yeast overgrowth, although this too might well assist in reducing overall symptom distress. Where does the cause lie in this particular individual’s FMS? Probably in a complex array of interlocking (often historical) features, which may be impossible to untangle. Therefore, approaches such as those which direct themselves at the allergy or at the increased permeability, while possibly (in this instance) valid and helpful, are not necessarily dealing with fundamental causes. • increased susceptibility to environmental stressors resulting from reduction in neural plasticity. Adults with fibromyalgia syndrome report high rates of childhood trauma. Neuroendocrine abnormalities have also been noted in this population. Findings suggest that severe traumatic experiences in childhood may be a factor of adult neuroendocrine dysregulation among fibromyalgia sufferers. Trauma history should be evaluated and psychosocial intervention may be indicated as a component of treatment for fibromyalgia. The ‘causes’ within this model can be seen to be widely spread. Goldstein’s (apparently successful) interventions deal with what is happening at the end of this complex sweep of events when the neural network has, as a result, become dysfunctional. By manipulating the biochemistry of that end-state, many (Goldstein says most) of his patients’ symptoms apparently improve dramatically and rapidly. Such improvement does not necessarily indicate that underlying causes have been addressed; if these are still operating, future health problems may be expected to eventually emerge. 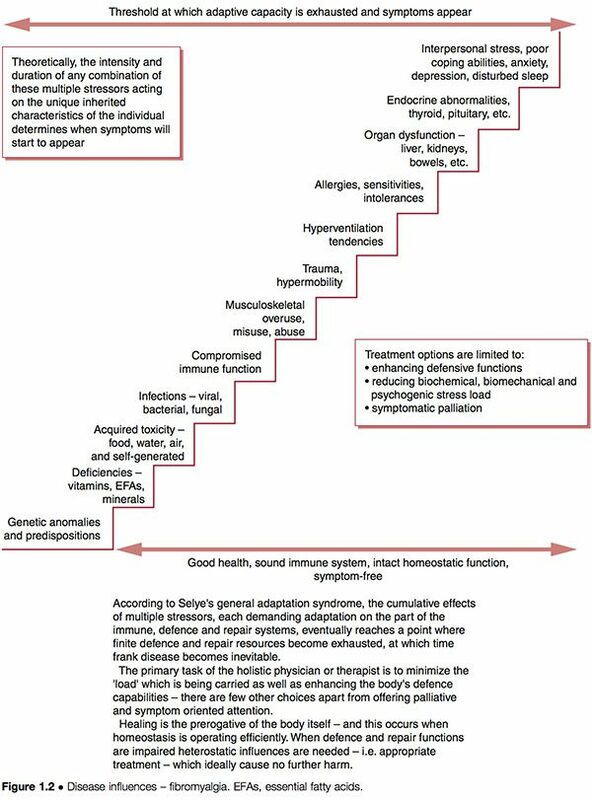 The schematic representation of a ‘stairway to ill-health’ (Fig. 1.2) indicates some of the possible features ongoing in complicated dysfunctional patterns such as FMS, where adaptive resources have been stretched to their limits, and the ‘stage of exhaustion’ in Selye’s general adaptation syndrome has been reached (Selye 1952). See also the discussion of allostasis in Chapter 3, particularly Table 3.2. 1. Biochemical factors. These can include toxicity, deficiency, infectious, endocrine, allergic and other characteristics (Wood 2006). c. neurological (sensitization, hypersensitivity – ‘wind-up’) (Staud et al 2005). 3. Psychosocial factors. These might include depression and/or anxiety traits, poor stress coping abilities, post-traumatic stress disorders, etc. (Arguellesa et al 2006). 3. palliate the symptoms, hopefully without producing any increase in adaptive demands on an already overloaded system. Which of these tactics are being employed in Goldstein’s treatment approach in which drug-induced biochemical manipulation is being carried out, and does this address causes or symptoms, and does this matter, as long as there is overall improvement? The particular philosophical perspective adopted by the practitioner/therapist will determine his judgement on this question. Some may see the rapid symptom relief claimed for the majority of these patients as justifying Goldstein’s particular therapeutic approach. Others might see this as offering short term benefits, not addressing underlying causes, and leaving the likelihood of a return of the original symptoms, or of others evolving, a probability. These issues will be explored in relation to this and other approaches to treatment of FMS in later chapters. • post-traumatic stress disorder (PTSD). MPS, FMS, MCS (for example, in relation to what has become known as Gulf War syndrome) and CFS – their similarities, and the sometimes great degree of overlap in their symptom presentation, as well as their differences – will be examined in later chapters. One feature of all of these conditions which has been highlighted is based on a toxic/biochemical hypothesis, involving ‘elevated levels of nitric oxide and its potent oxidant product, peroxynitrite’ (Pall 2001). • FMS could be a neuroendocrine disturbance, particularly involving thyroid hormone imbalances (see Ch. 10) (Garrison & Breeding 2003, Honeyman 1997, Lowe 1997, Lowe & Honeyman-Lowe 2006) and/or hypophyseal growth hormone imbalances (possibly as a direct result of sleep disturbance – a key feature of FMS, and/or lack of physical exercise) (Moldofsky 1993). The question which then needs to be asked is, what produces the endocrine disturbance? Is it genetically determined as some believe, or is it the result of deficiency, toxicity, allergy, an autoimmune condition or infection? • Duna & Wilke (1993) propose that disordered sleep leads to reduced serotonin production, and consequent reduction in the pain-modulating effects of endorphins and increased ‘substance P’ levels, combined with sympathetic nervous system changes resulting in muscle ischaemia and increased sensitivity to pain (Duna & Wilke 1993). This hypothesis starts with a symptom, sleep disturbance, and the logical question is, what produces this? • Dysautonomia, autonomic imbalance or dysfunction, characterized by ‘relentless sympathetic hyperactivity’, more prominent at night (Martinez-Lavin & Hermosillo 2005), have been proposed as foundational causes in a subgroup of individuals with FMS (and CFS). Many such patients have also been labelled with Gulf War-related illness (Geisser et al 2006, Haley et al 2004, van der Borne 2004). 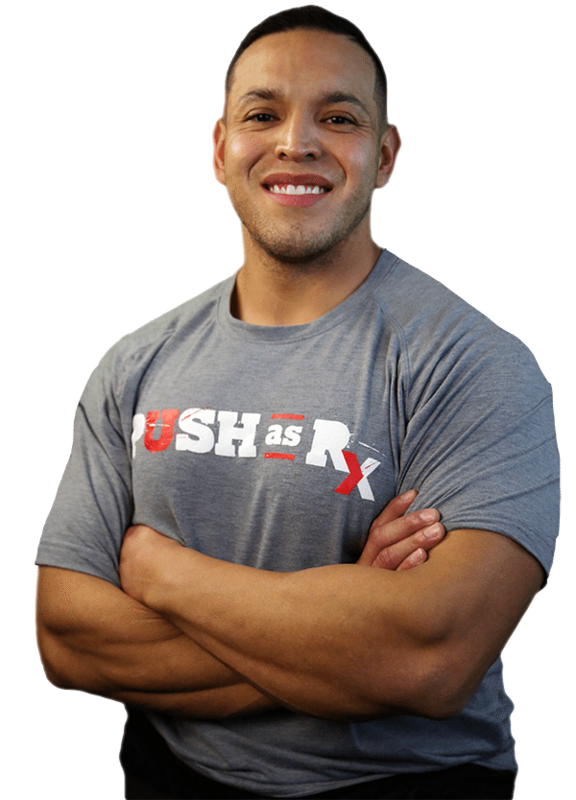 • Muscle microtrauma may be the cause, possibly due to genetic predisposition (and/or growth hormone dysfunction), leading to calcium leakage, and so increasing muscle contraction and reducing oxygen supply. An associated decrease in mitochondrial energy production would lead to local fatigue and an inability for excess calcium to be pumped out of the cells, resulting in local hypertonia and pain (Wolfe et al 1992). The question as to why muscle microtrauma occurs more in some people than in others, or why repair is slower, requires investigation. • FMS may be a pain modulation disorder resulting at least in part from brain (limbic system) dysfunction and involving mistranslation of sensory signals and consequent misreporting (Goldstein 1996). Why and how the limbic system and neural networks become dysfunctional is the key to this hypothesis (promoted by Goldstein, as discussed above). • It has been suggested that what are termed idiopathic pain disorders (IPD) – such as temporomandibular joint disorders (TMJD), fibromyalgia syndrome (FMS), irritable bowel syndrome (IBS), chronic headaches, interstitial cystitis, chronic pelvic pain, chronic tinnitus, whiplash-associated disorders and vulvar vestibulitis (VVS) – are mediated by an individual’s genetic variability, as well as by exposure to environmental events. The primary pathways of vulnerability that underlie the development of such conditions are seen to involve pain amplification and psychological distress, modified by gender and ethnicity (Diatchenko et al 2006) (Fig. 1.4). • FMS may be a congenitally acquired disorder, possibly related to inadequate thyroid regulation of gene transcription, with an autosomal dominant feature (Lowe et al 1997, Pellegrino et al 1989). As will be outlined, some research studies have found evidence of a genetically linked predisposition towards FMS. Congenital structural abnormalities, such as extreme ligamentous laxity (i.e. hypermobility (Karaaslan et al 2000)), and Chiari malformations (see further discussion of this in Ch. 3 (Kesler & Mandizabal 1999, Thimineur et al 2002)), certainly seem to predispose toward FMS. The questions this raises include: which factors exacerbate these predispositions, and can anything be done about them? • Hudson et al (2004) have proposed that fibromyalgia is one member of a group of 14 psychiatric and medical disorders (attentiondeficit/hyperactivity disorder, bulimia nervosa, dysthymic disorder, generalized anxiety disorder, major depressive disorder, obsessive-compulsive disorder, panic disorder, post-traumatic stress disorder, premenstrual dysphoric disorder and social phobia – plus four medical conditions: fibromyalgia, irritable bowel syndrome, migraine, and cataplexy), collectively termed affective spectrum disorder (ASD), hypothesized to share possibly heritable pathophysiological features. Following detailed analysis of data from 800 individuals with and without fibromyalgia (and the additional conditions under assessment), Hudson et al concluded that the present information added to evidence that the psychiatric and medical disorders, grouped under the term ASD, run together in families, raising the possibility that these disorders might share a heritable physiological abnormality. • The underlying cause of FMS is seen by some to result from the (often combined) involvement of allergy, infection, toxicity and nutritional deficiency factors which themselves produce the major symptoms of FMS (and CFS), such as fatigue and pain, or which are associated with endocrine imbalances and the various consequences outlined above, such as thyroid hormone dysfunction and/or sleep disturbance (Abraham & Lubran 1981, Bland 1995, Cleveland et al 1992, Fibromyalgia Network Newsletters 1990–94, Pall 2001, Robinson 1981, Vorberg 1985). The list of possible interacting features such as these, which frequently seem to coexist in someone with FMS, offers the possibility of intervention strategies which seem to focus on causes rather than effects. For example, specific ‘excitotoxins’ such as monosodium glutamate (MSG) have been identified as triggering FMS symptoms (Smith et al 2001). These and other examples will be examined in later chapters. • Use of MRI and other scanning/imaging technology suggests that the central sensitization concept has objective evidence to support it. This subject is discussed further in Chapter 3 (see ‘The polysymptomatic patient’) and Chapter 4 (see ‘Central sensitization hypothesis’ and Fig. 3.1). Two examples of imaging evidence, relating to altered brain morphology and/or behaviour in relation to FMS, are summarized in Box 1.3. It has become obvious that those who are type O and suffering from fibromyalgia can see quite dramatic responses if they can stick to the wheat-free component of the diet for a long enough duration. A recent study indicates that dietary lectins interacting with enterocytes (cells lining the intestines) and lymphocytes may facilitate the transportation of both dietary and gutderived pathogenic antigens to peripheral tissues, which in turn causes persistent immune stimulation at the periphery of the body, such as the joints and muscles (Cordain et al 2000). This, despite the fact that many nutrition ‘authorities’ still question whether lectins even get into the systemic circulation! In genetically susceptible individuals, this lectin stimulation may ultimately result in the expression of disorders like rheumatoid arthritis and fibromyalgia via molecular mimicry, a process whereby foreign peptides, similar in structure to endogenous peptides, may cause antibodies or T-lymphocytes to cross-react and thereby break immunological tolerance. Thus by removing the general and type O specific lectins from the diet, we allow for the immune system to redevelop tolerance, the inflammation begins to ebb, and healing can begin. • Many FMS patients demonstrate low carbon dioxide levels when resting – an indication of possible hyperventilation involvement. The symptoms of hyperventilation closely mirror those of FMS and CFS, and the pattern of upper chest breathing which it involves severely stresses the muscles of the upper body which are most affected in FMS, as well as producing major oxygen deficits in the brain and so influencing its processing of information such as messages received from pain receptors (Chaitow et al 2002, Janda 1988, King 1988, Lum 1981). When hyperventilation tendencies are present, they can be seen in some instances to be a response to elevated acid levels (because of organ dysfunction perhaps) or they can be the result of pure habit. Breathing retraining can, in some FMS patients, offer a means of modifying symptoms rapidly (Readhead 1984). • Psychogenic (or psychosomatic) rheumatism is the name ascribed to FMS (and other nonspecific chronic muscle pain problems) by those who are reluctant to see an organic origin for the syndrome. Until the 1960s it was suggested that such conditions be treated as ‘psychoneurosis’ (Warner 1964). In FMS, as in all chronic forms of ill-health, there are undoubtedly elements of emotional involvement, whether as a cause or as an effect. These impact directly on pain perception and immune function, and, whether causative or not, benefit from appropriate attention, assisting both in recovery and rehabilitation (Melzack & Wall 1988, Solomon 1981). • FMS is seen by some to be an extreme of the myofascial pain syndrome (MPS), where numerous active myofascial triggers produce pain both locally and at a distance (Thompson 1990). Others see FMS and MPS as distinctive, but recognize that ‘it is not uncommon for a patient with myofascial pain syndrome to progress with time to a clinical picture identical to that of FMS’ (Bennett 1986a). Among the most important practical pain-relieving approaches to FMS will be the need to identify and deactivate myofascial trigger points which may be influencing the overall pain burden. A number of different approaches, ranging from electroacupuncture to manual methods, will be detailed (see Chs 6, 8 and 9 in particular). • Trauma (e.g. whiplash) seems to be a key feature of the onset in many cases of FMS, and especially cervical injuries, particularly those involving the suboccipital musculature (Bennett 1986b, Curatolo et al 2001, Hallgren et al 1993). Recognition of mechanical, structural factors allows for interventions which address their repercussions, as well as the psychological effects of trauma. In Chapter 9 Carolyn McMakin presents compelling evidence for the use of microcurrents in treatment of FMS of traumatic (especially of the cervical region) origin. 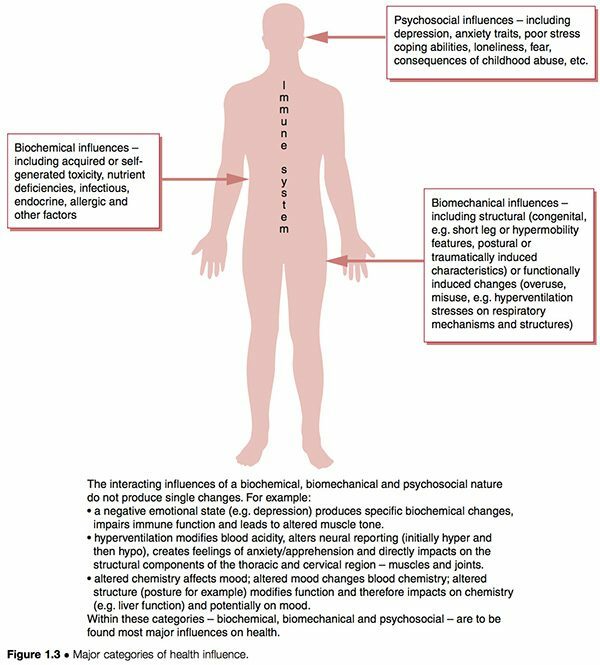 • There is an ‘immune dysfunction’ model for myalgic encephalomyelitis (ME) – that uniquely British name for what appears to be an amalgam of chronic fatigue syndrome and fibromyalgia. This proposes a viral or other (vaccination, trauma, etc.) initial trigger which may lead to persistent overactivity of the immune system (overproduction of cytokines). Associated with this there may be chemical and/or food allergies, hypothalamic disturbance, hormonal imbalance and specific areas of the brain (e.g. limbic system) ‘malfunctioning’. The primary feature of this model is the overactive immune function, with many of the other features, such as endocrine imbalance and brain dysfunction, secondary to this (Macintyre 1993b). In recent research, the presence of systemic bacterial, mycoplasmal and viral coinfections in many patients with CFS and FMS has been a feature (Nicolson et al 2002). Current research and clinical consensus seem to indicate that FMS is not primarily a musculoskeletal problem, although it is in the tissues of this system that its major symptoms manifest: ‘Fibromyalgia is a chronic, painful, musculo-skeletal condition characterised by widespread aching and points of tenderness associated with: 1) changed perception of pain, abnormal sleep patterns and reduced brain serotonin; and 2) abnormalities of microcirculation and energy metabolism in muscle’ (Eisinger et al 1994). These characteristics, involving abnormal microcirculation and energy deficits, are the prerequisites for the evolution of localized areas of myofascial distress and neural hyper-reactivity (i.e. trigger points). As indicated, one of the key questions to be answered in any given case is the degree to which the person’s pain is deriving from myofascial trigger points, or other musculoskeletal sources, since these may well be more easily modified than the complex underlying imbalances which are producing, contributing to, or maintaining the primary FMS condition. A great deal of research into FMS (under different names – see Box 1.1), and of the physiological mechanisms that increase our understanding of the FMS phenomenon, has been conducted over the past century (and earlier) and is worthy of review. Additional research in parallel with that focused on chronic muscular pain may clarify processes at work in this complex condition. Among the most important researchers in the area of musculoskeletal dysfunction and pain over the past half century has been Professor Irwin Korr, whose work in explaining the facilitation phenomenon offers important insights into some of the events occurring in FMS and, more specifically, in myofascial pain settings. Needless to say, these often overlap. As suggested above, in a clinical context it is vital to know what degree of the pain being experienced in FMS is the result of myofascial pain, since this part of the pain package can relatively easily be modified or eliminated (see Chs 8 and 9). Neural structures can become hyper-reactive in either spinal and paraspinal tissues or almost any other soft tissue. When they are found close to the spine the phenomenon is known as segmental facilitation. When such changes occur in ligaments, tendons or periosteal tissues, they are called trigger points; if situated in muscles or in fascia they are termed ‘myofascial’ trigger points. In early studies by the most important researcher into facilitation, Irwin Korr (1970, 1976), he demonstrated that a feature of unilateral segmental facilitation was that one side would test as having normal skin resistance to electricity compared with the contralateral side, the facilitated area, where a marked reduction in resistance was present. When ‘stress’ – in the form of needling or heat – was applied elsewhere in the body, and the two areas of the spine were monitored, the area of facilitation showed a dramatic rise in electrical (i.e. neurological) activity. In one experiment volunteers had pins inserted into a calf muscle in order to gauge the effect on the paraspinal muscles, which were monitored for electrical activity. While almost no increase occurred in the normal region, the facilitated area showed greatly increased neurological activity after 60 seconds (Korr 1977) (Fig. 1.5). This and numerous similar studies have confirmed that any form of stress impacting the individual – be it climatic, toxic, emotional, physical or anything else – will produce an increase in neurological output from facilitated areas. In Chapter 9, Carolyn McMakin describes how some forms of trauma, particularly those affecting cervical structures, can lead to chronic local facilitation, resulting in FMS-like pain. She reports that treatment utilizing microcurrent, manual modalities and nutritional support can frequently ease, or even remove, such symptoms. The concept of the facilitated segment states that because of abnormal afferent or sensory inputs to a particular area of the spinal cord, that area is kept in a state of constant increased excitation. This facilitation allows normally ineffectual or subliminal stimuli to become effective in producing efferent output from the facilitated segment, causing both skeletal and visceral organs innervated by the affected segment to be maintained in a state of overactivity. It is probable that the somatic dysfunction with which a facilitated segment is associated, is the direct result of the abnormal segmental activity as well as being partially responsible for the facilitation. Increasing evidence points towards peripheral tissues as relevant contributors of painful impulse input that might either initiate or maintain central sensitization, or both. It is well known that persistent or intense nociception can lead to neuroplastic changes in the spinal cord and brain, resulting in central sensitization and pain. This mechanism represents a hallmark of FM and many other chronic pain syndromes, including irritable bowel syndrome, temporomandibular disorder, migraine, and low back pain. Importantly, after central sensitization has been established only minimal nociceptive input is required for the maintenance of the chronic pain state. Additional factors, including pain related negative affect and poor sleep have been shown to significantly contribute to clinical FM pain. The similarities between modern neurological observations and Korr’s original work are clear. Emotional arousal is also able to affect the susceptibility of neural pathways to sensitization. The increase in descending influences from the emotionally aroused subject would result in an increase in toxic excitement in the pathways and allow additional inputs to produce sensitization at lower intensities. This implies that highly emotional people, or those in a highly emotional situation, would be expected to show a higher incidence of facilitation of spinal pathways or local areas of myofascial distress (Baldry 1993). This has a particular relevance to fibromyalgia, where heightened arousal (for a variety of possible reasons, as will become clear), in addition to possible limbic system dysfunction, leads to major influences from the higher centers (Goldstein 1996). Since the higher brain centers do influence the tonic levels of the spinal paths, it might be expected that physical training and mental attitudes would also tend to alter the tonic excitability, reducing the person’s susceptibility to sensitization from everyday stress. Thus the athlete would be expected to withstand a comparatively high level of afferent input prior to experiencing the self-perpetuating results of sensitization. This, too, has a relevance to fibromyalgia, where there exists ample evidence of beneficial influences of aerobic training programs (McCain 1986, Richards & Scott 2002). Researchers have shown that a small number of motor units, located in particular muscles, may display almost constant or repeated activity when influenced psychogenically. Low amplitude activity (using surface EMG) was evident even when the muscle was not being employed, if there was any degree of emotional arousal. ‘A small pool of lowthreshold motor units may be under considerable load for prolonged periods of time … motor units with Type 1 [postural] fibers are predominant among these. If the subject repeatedly recruits the same motor units, the overload may result in a metabolic crisis.’ (Waersted et al 1993). The implications of this research are profound for they link even low grade degrees of emotional distress with almost constant sensitization of specific myofascial structures, with the implications associated with facilitation and pain generation. This aetiology parallels the proposed evolution of myofascial trigger points, as suggested by Simons et al (1999). Research by Ronald Kramis has shown that, in chronic pain settings, non-nociceptive neurons can become sensitized to carry pain impulses (Kramis 1996). Hypersensitization of spinal neurons may actually involve non-nociceptive neurons altering their phenotype so that they commence releasing substance P. This, it is thought, may play a significant part in FMS pain perception, as increased levels of substance P in the cerebrospinal fluid maintain heightened amplification of what would normally be registered as benign impulses. The research suggests that impulses from associated conditions such as ongoing viral activity, ‘muscular distress’ or irritable bowel may be adequate to maintain the central pain perception. Apart from paraspinal tissues, where segmental facilitation, as described above, manifests, localized areas of neural facilitation can occur in almost all soft tissues: these are called myofascial trigger points. Much of the basic research and clinical work into this aspect of facilitation has been undertaken by doctors Janet Travell and David Simons (Simons et al 1999; Travell 1957; Travell & Simons 1986, 1992; see also Chs 6 and 8). Travell and Simons are on record as stating that if a pain is severe enough to cause a patient to seek professional advice (in the absence of organic disease), it usually involves referred pain, and therefore a trigger area is probably a factor. They remind us that patterns of referred pain are constant in distribution in all people, and that only the intensity of referred symptoms/pain will vary. • low oxygenation of tissues (aggravated by tension, stress, inactivity, poor respiration) (Simons et al 1999, Travell & Simons 1986, 1992). This list corresponds closely with factors that are key aggravating agents for many (most) people with fibromyalgia, suggesting that the connection between facilitation (trigger point activity) and FMS is close (Starlanyl & Copeland 1996). 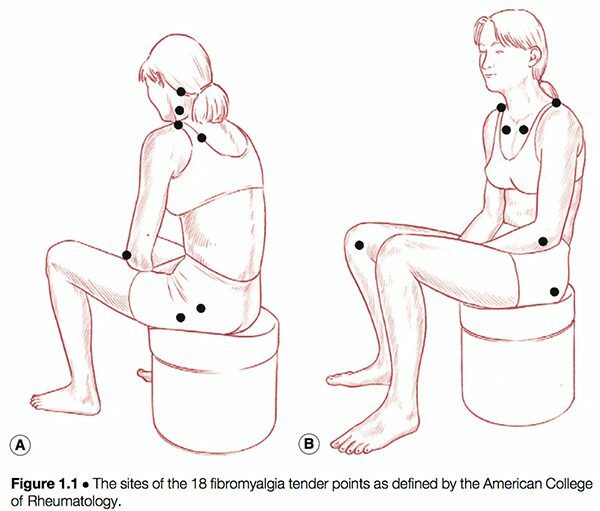 Myofascial trigger points are, however, not the cause of fibromyalgia, and myofascial pain syndrome is not FMS, although they may coexist in the same person at the same time. Myofascial trigger points do undoubtedly frequently contribute to the painful aspect of FMS, and as such are deserving of special attention. As will be explained in later chapters, there are a number of ways in which deactivation or modulation of myofascial trigger points can be achieved. Some practitioners opt for approaches that deal with them manually, while others prefer microcurrents or electro-acupuncture methods or variations on these themes, with yet others suggesting that reduction in the number and intensity of stress factors – of whatever type – offers a safer approach to reducing the influence of facilitation on pain. Following this introduction to the concept of hyper-reactive, sensitized (facilitated) neural structures, it would be justifiable to enquire as to whether or not what is happening in the brain and in the neural network, as described by Goldstein, is not simply facilitation on a grand scale. The outline of some of the leading current hypotheses as to the aetiology of FMA in Chapter 4 may shed light on this possibility. Early FMS research has been presented in summary form in Box 1.1. Aspects of that research, and how some of it correlates with more recent findings, are outlined below. R. Gutstein, a Polish physician who emigrated to the UK prior to the Second World War, was a remarkable researcher who published papers under different names (M. G. Good, for example) before, during and following the war. In them he clearly described the myofascial trigger point phenomenon, as well as what is now known as fibromyalgia, along with a great many of its predisposing and maintaining features. Gutstein termed reflex areas he identified ‘myodysneuria’ and suggested that the reference phenomena of such spots or ‘triggers’ would include pain, modifications of pain, itching, hypersensitivity to physiological stimuli, spasm, twitching, weakness and trembling of striated muscles, hyper- or hypotonus of smooth muscle of blood vessels and of internal organs, and/or hyper- or hyposecretion of visceral, sebaceous and sudatory glands. Somatic manifestations were also said to occur in response to visceral stimuli of corresponding spinal levels (Gutstein 1944). In all of these suggestions Gutstein seems to have been in parallel with the work of Korr. Gutstein/Good’s method of treatment involved the injection of an anaesthetic solution into the trigger area. He indicated, however, that where accessible (e.g. muscular insertions in the cervical area) the chilling of these areas combined with pressure would yield good results. • visceral diseases which could intensify and precipitate somatic symptoms in the distribution of their spinal and adjacent segments. We can see from these examples of Gutstein’s thinking strong echoes of the facilitation hypothesis in osteopathic medicine. • marked hypertonicity may require the application of deep pressure to demonstrate pain. In 1947 Travell & Bigelow produced evidence supporting much of what Gutstein (1944) had reported. They indicated that high intensity stimuli from active trigger areas produce, by reflex, prolonged vasoconstriction with partial ischaemia in localized areas of the brain, spinal cord, or peripheral nerve structures. A widespread pattern of dysfunction might then result, affecting almost any organ of the body. These early research findings correlate well with modern fibromyalgia and chronic fatigue research and the hypothesis of ‘neural network disorders’ as described by Goldstein (1996), and in British and American research utilizing SPECT scans, which show clearly that severe circulatory deficits occur in the brainstem and in other areas of the brain of most people with CFS and FMS (Costa 1992). The changes which occur in tissue involved in the onset of myodysneuria/fibromyalgia, according to Gutstein, are thought to be initiated by localized sympathetic predominance, associated with changes in the hydrogen ion concentration and calcium and sodium balance in the tissue fluids (Petersen 1934). This is associated with vasoconstriction and hypoxia/ischaemia. Pain resulted, he thought, by these alterations affecting the pain sensors and proprioceptors. Muscle spasm and hard, nodular, localized tetanic contractions of muscle bundles, together with vasomotor and musculomotor stimulation, intensified each other, creating a vicious cycle of self-perpetuating impulses (Bayer 1950). 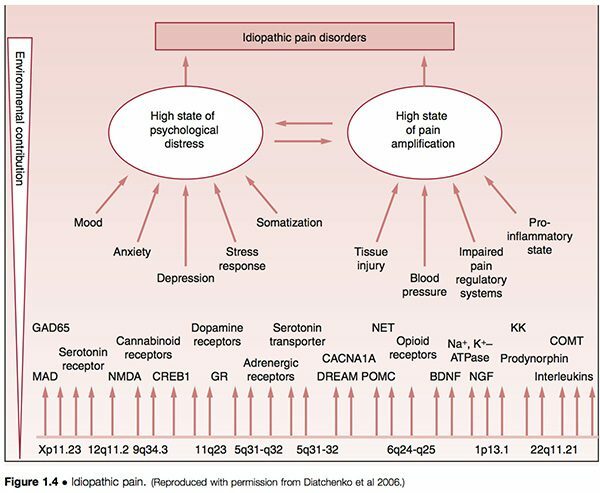 Varied and complex patterns of referred symptoms might then result from such ‘trigger’ areas, as well as local pain and minor disturbances. Sensations such as aching, soreness, tenderness, heaviness and tiredness may all be manifest, as may modification of muscular activity due to contraction, resulting in tightness, stiffness, swelling and so on. It is clear from this summary of his work that Gutstein was describing fibromyalgia, and many of its possible causative features. Chapter 2 examines what FMS is, as well as what it is not, with suggestions for differential diagnosis. etiology and therapy of fibromyalgia. of resistance to thyroid hormone. muscles of the upper cervical spine. Macintyre A 1993a What causes ME? probiotics in critically ill patients. Mense S, Simons D 2001 Muscle pain. in chronic fatigue syndrome patients. Tuncer T 1997 Primary FMS and allergy. veterans’ hearts don’t rest at night. antigens in irritable bowel syndrome. Fibromyalgia, 4 Ways Chiropractic Helps | El Paso, TX.